After login you will be presented with the Survey List page. Think of this as your Survey Manager "home" page. From here you can reach everything you need. Excluding ACFE/ACE users, if this is the first time you have accessed your organisation, you will generally find no surveys in your survey list. Surveys may be present because they have been deployed to your organisation from a parent organisation (like a Region) or remain there from previous activities. These will be surveys you or your previous users have created for your organisation. "Edit" - This allows you to edit certain presentaional aspects of the survey such as the enquiry email address, the logo graphic, incitation text, help, etc. For deployed surveys (like the LSS), you can not change the questions in the survey, but for other surveys you have access to add remove or change questions, etc. Unless you wish to change the default appearance of a deployed survey you do not need to use the action. Delete - While a survey is in draft mode, it can be deleted from your organisation. Once it the survey is activated or receives it's first responses the delete action will no longer be visible. "Manage" - This is the main action you will use. It enables publication of the survey to responders, sending of invitation, viewing of reports, and general management of the survey. For Providers using email invitations exclusively, this will be the only action in which you are interested. "Data Entry" - The data entry action enables the entry of surveys from both hardcopy and telephone/interview. A survey administrater or data entry account holder can enter the survey responsers by selecting from the list of published responders. "Make Template" - This action saves your current survey as a template that can then be used to build new fully editable versions of the survey. 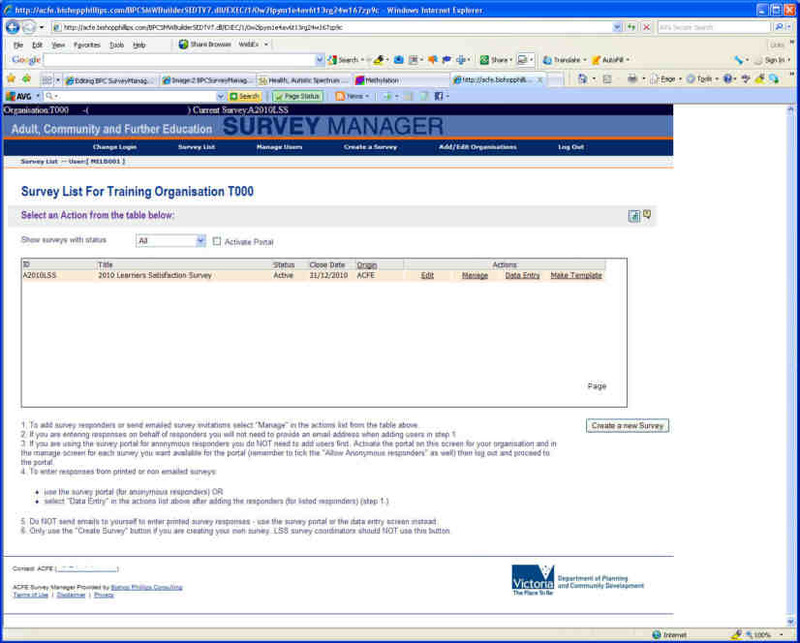 Both the original survey used for the template and surveys produced from the template remain independent. If you wish to use the portal (or even think you might use it) you can do this by ticking the "Activate portsl" checkbox. The system will invent a password if you use with the portal, but you are free to change it. Change Login - displays the login screen. Primarilly for the use of admin users and others with membership of multiple organisations. Survey List - displays this screen. Display your current survey list. Manage Users - displays, edit or create the users of this organisation. You would use this to create data entry users. While you can create users for assignment to a survey in this area, the V6 survey manager web client favours creationg of responders specifically for a survey. V7 simplifies the assignment of exisiting users to a survey.